This blog will dive into some of the most commonly asked questions about economic nexus and how you may be affected by these new laws—plus what you can do to comply. Economic nexus describes a transaction threshold that a seller must cross before being required to collect sales tax from buyers in a certain state. In the Wayfair case, South Dakota enforced a threshold of >$100,000 in annual sales or >200 orders from buyers within its state. Other states are now looking to establish similar criteria, but not every state has defined clear guidelines yet. Each state can evaluate your business. Meaning, if you have economic nexus in all 50 states, you’re obligated to collect sales tax in all 50 states individually. That’s why it’s crucial to proactively audit your nexus and register for sales tax permits where applicable to avoid big penalties. 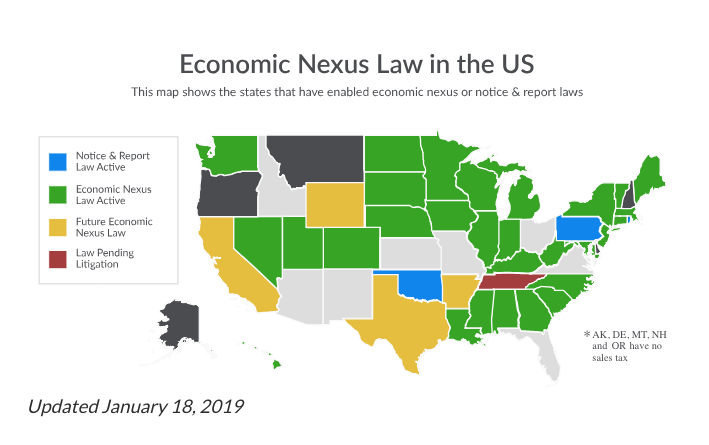 How Do Economic Nexus Laws Vary by State? Taxable items - When it comes to economic nexus, many states choose to evaluate you according to gross sales, not just sales on taxable items. Beyond looking at direct sales to people within its state (as indicated by the “ship to” addresses of the transactions), states may also look at affiliate or click-through sales. Sales tax rate - Note: this applies to taxes at both the state and local levels. Currently, 45 states and Washington, D.C., collect statewide sales tax and 38 states collect local sales tax, some of which exceed state rates. While separate from economic nexus laws, the below laws may also apply in the states where you do business. These are equally important to be mindful of, as they’ll impact your level of collection responsibility regardless of whether you have nexus in a state. Notice and report laws - Some states like Oklahoma and Pennsylvania still enforce notice and report laws that are similar, but different from, economic nexus laws in that you must comply if your gross sales reach a certain threshold. In other words, even if you don’t have nexus in a state (and are thereby a “non-collecting business”), you may have to follow reporting requirements to ensure that buyers pay use tax. These laws have been around since July 1, 2017 and will apply retroactively if you haven’t complied with them yet. Marketplace facilitator laws - Eleven states currently have active marketplace facilitator laws that require marketplaces like Amazon to collect and remit sales tax on behalf of its third-party sellers’ transactions. Note: this doesn’t mean you’re completely off the hook. You’ll still want to keep your sales tax permits if you’re making sales in the state from other platforms, such as your website. If you don’t sell in the state outside of the facilitator, you may be required to file a “zero return” anyhow or register for non-reporting sales tax status. Dropshippers. Online-only sellers. Small and mid-sized companies with more economic nexus than physical nexus. Dropshippers and wholesalers are in an interesting position. Not only do sellers have to know where to collect taxes, but also how to avoid paying taxes to vendors. Vendors, in turn, must attain the right exemption/resale certificate from retailers to avoid requiring tax on a transaction. However, if a seller has no obligation to collect sales tax in a “ship to” or “deliver to” state, then the vendor may need to collect sales tax from the sellers unless they have a valid certificate for each “ship-to” state. Concerning online sellers and small-to-mid-sized businesses, economic nexus will require tax obligations that didn’t used to exist before. Regardless of whether or not you have a brick-and-mortar store, employees or warehouses (among other physical entities) located in a given state, you may have to start collecting taxes if you’re making sales there. While larger companies may have been collecting taxes under physical nexus and/or have the resources in place to monitor compliance, smaller ones may have to invest in new tax services. The rolled-up costs of paying sales tax and paying for compliance could even impact product prices and have a trickle-down effect on buyers. Does Economic Nexus Apply to Past Sales? Doesn’t seem so. Right after the Wayfair decision dropped, some states like Hawaii tried to pull a fast one and apply economic nexus retroactively. However, these have since been dropped and will likely be banned in the immediate future. So...Physical Nexus is Old News? If only it were that simple! Physical nexus can still apply—and is often the first thing that states look for before looking for economic nexus. This is why it’s imperative for you to stay up to date with nexus policies, rates and updates for every state you do business in. Suffice it to say that you don’t want to start down this path. A state may ask you to pay a years’ worth of sales, seize personal or business assets, require interest, or more, even if you failed to comply by mistake or due to a misunderstanding of the law. I’m Overwhelmed. What Do I Do? You don’t have to go at this alone. Taxjar is a trusted Zentail partner that can automate sales tax reporting, calculation and filing for online sellers and offers a 30-day free trial if you want to give it a whirl. Centralizing your multichannel operations and business analytics through a platform like—you guessed it—Zentail can further put your team at ease by offering full, year-round visibility over revenue and orders by state across all your selling channels. If you’re already using Zentail, we recommend using your Import/Export tool to evaluate your nexus profile: Create a sales order report template that includes the columns “payment” and “shipping address state code,” then run a report on orders from the appropriate time frame. The resulting report will let you calculate all the payments made by state and enable you to take a measured approach in registering for a sales permit, i.e., know what you owe and where you owe it, plus be able to comply before registering. If you already owe taxes, do a voluntary disclosure then apply for a permit. Consider also adjusting product prices via Zentail based on how taxes impact your margins. I'm Lazy, Can I Have the TLDR Version of Everything? In summary, the Wayfair decision in June 2018 threw a curveball in the sales tax world. Online sellers and companies that profit from interstate sales must now be hyperconscious of how many sales (both by gross sales and order volume) they make to people located in each state, and whether or not they meet economic nexus thresholds. When economic nexus does apply to your business, you must register for a sales tax permit and collect and remit sales tax to the state. For additional help complying with these laws, we recommend using TaxJar and/or contacting your Zentail specialist for support.